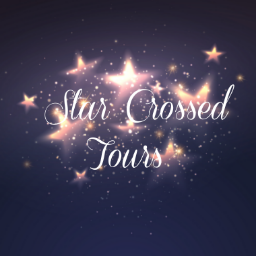 I'm absolutely over the moon to be starting my 2017 blogging journey off by taking part in the blog tour for such an amazing author. I have been a fan of Jill Mansell for many years now and was lucky to meet Jill last year - you can read more about that here. If I'm ever in a reading slump or want a book that I know I will 100% lose myself in then one of Jill's is where I turn to. I love how she can take a handful of characters and interweave their stories. 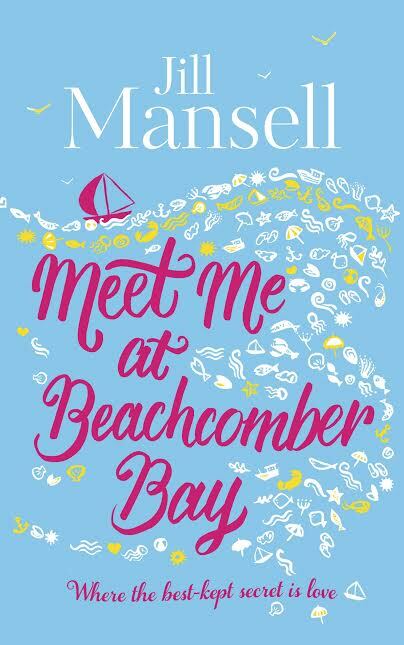 This, along with her idyllic locations makes perfect reading and I can tell you now that her new novel, Meet Me at Beachcomber Bay is no execption - more on that when I post my review later in the week though! 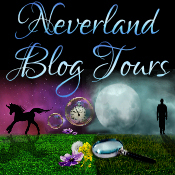 For now, I'm handing the blog over to Jill for a blog tour guest post. I hope you enjoy. 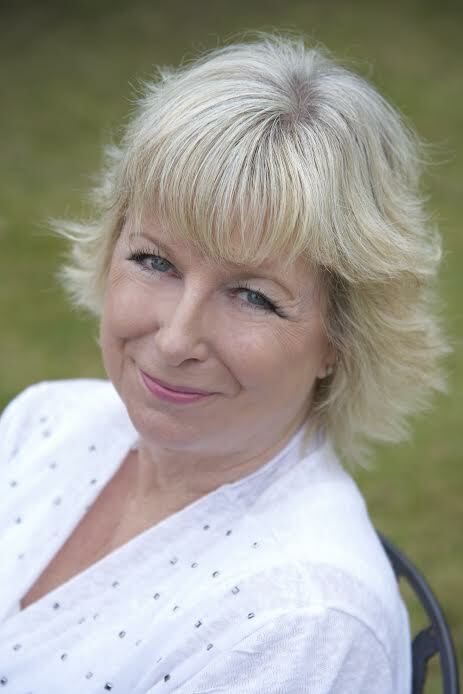 A Guest Post by Jill Mansell. Hello, a happy new year to all, and can I show you my main Christmas present? I was so thrilled when I saw this painting for the first time that I got a bit teary because it was just so perfect! So, what else is in the room? The view from the window is of the sports fields behind our house, where footballers do their footballery thing. There are hockey and cricket pitches, and tennis courts too - lots to distract me while I'm supposed to be working! There's a painting on the left hand wall by my other favourite artist Yvonne Coomber, and the one next to it is another original by Rose Popay - I snapped it up when she had a big sale of her work on Facebook. The big mirror was bought from a charming stained-glass artist in Bradford on Avon several years back, and I subsequently used the stunning setting of his workplace in my book Falling for You. The gold stag's head was a Christmas present from Cino and I hang my necklaces from the antlers. The two mirrored chests of drawers were found last year in a little shop in Tetbury, which is where I went to school - and it also became the setting for Rumour Has It. Next, displayed on the chests of drawers are photos of my children and gorgeous presents they've given me over the years. On the window sill is my cluttered collection of make up, hanging above it is my fabulous string of stained glass bunting bought from a crafter on Etsy, then on the right hand wall is the painting of this painting. The TV is on, because I always have it on while I'm writing, and I love to steal plot ideas from ITV's This Morning, so that's Phillip Schofield and Holly Willoughby there on the screen. And finally, there on the floor are a couple of pairs of my Swarovski-encrusted flip-flops (I have lots of them, bought from crystal-applying experts on eBay!) 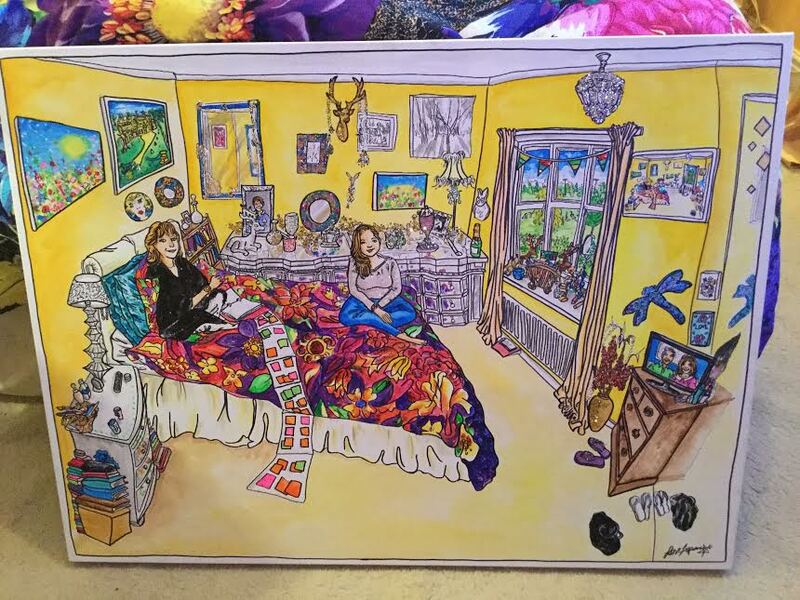 plus my favourite black glittery handbag which also featured in the first painting Rose did four years ago of me and Lydia in our living room. 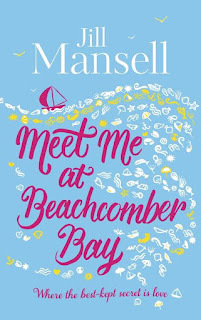 Jill Mansell is the author of over twenty Sunday Times bestsellers including The One You Really Want and You and Me, Always. Take a Chance on Me won the RNA’s Romantic Comedy Prize, and in 2015 the RNA presented Jill with an outstanding achievement award. Jill started writing fiction while working in the field of Clinical Neurophysiology in the NHS, but now writes full time. Huge thanks to Jill for taking the time to provide the guest post, also thanks to Katie Brown at Headline for other info.